Vietnam has developed by leaps and bounds since the war; the unified country's major cities are now connected securely by air travel and train travel routes. Eight days in Vietnam will expose you to the country's major culture and entertainment destinations - follow our eight-day itinerary to get the full Vietnam experience. The itinerary covers Ho Chi Minh City (also known as Saigon) in South Vietnam, Hanoi and Ha Long Bay in North Vietnam, and Hue and Hoi An in Central Vietnam. The trip begins in Saigon, by virtue of the city having Vietnam's busiest air hub, Tan Son Nhat International Airport. The destinations covered in each city are well-covered by nationwide tour companies like Sinh Tourist (www.thesinhtourist.vn), but every city offers the option of finding your own way around. This itinerary will also lay out your hotel options per city, covering all budgets from backpacker to luxury. Assuming you've checked into your Ho Chi Minh City hotel (budget travelers will love the cheap choices in Pham Ngu Lao, like the Kim Hotel), you can commence with your tour of the erstwhile capital of South Vietnam on the first full day of your trip. You can make arrangements with reputable tour offices like Sinh Tours (www.thesinhtourist.vn) to see the day's itinerary, but the destinations listed below can also be covered on your own time, if you can hire a ride to take you as far as the Cu Chi Tunnels and back. The Cu Chi Tunnels is about an hour's drive away from the city center, leading away into the jungles surrounding Ho Chi Minh City. In the days of the Vietnam War, before Saigon fell to the Communists, the Tunnels were a staging area for Viet Cong raids and a stopover on the Ho Chi Minh Trail. Today, the Cu Chi Tunnels are a showcase for Vietnamese triumphalism, with a museum and displays showing how the Viet Cong lived and fought in the tunnels during the dark days of Western colonialism. The Cu Chi tunnels can be covered in one morning; upon returning to the city, you can have a pho lunch at one of many noodle spots in the city, before proceeding to visit a number of tourist attractions within District 1. The top tourist spots in District 1 are quite close by to one another and can be covered in the space of an afternoon. The War Remnants Museum (28 Ð Vo Van Tan) stores and displays relics from the Vietnam War; the displays are understandably biased toward the Vietnamese Communist point of view. The Reunification Palace (135 Nam Ky Khoi Nghia) was the official residence of the President of South Vietnam, and where the last battle for the South Vietnamese Republic was fought and lost. The Notre Dame Cathedral in Ho Chi Minh City (Han Thuyen Street) is a beautiful relic of the days when Catholicism held sway over South Vietnam; the Cathedral is still consecrated as a Catholic house of worship, and Catholics still attend Mass here. The Saigon Central Post Office stands across the street from the Cathedral and is a throwback to the days of efficient French civil service: a working post office that retains traces of French colonial power, like an 18th-century map of Vietnam on the wall. The Saigon Town Hall (corner of Nguyen Hue Boulevard and The Le Thanh Ton Street) is presently a government building and is thus closed to visitors. But visitors can admire its French Colonial architecture from the outside, and pay respects to the iconic statue of Ho Chi Minh standing outside the building. 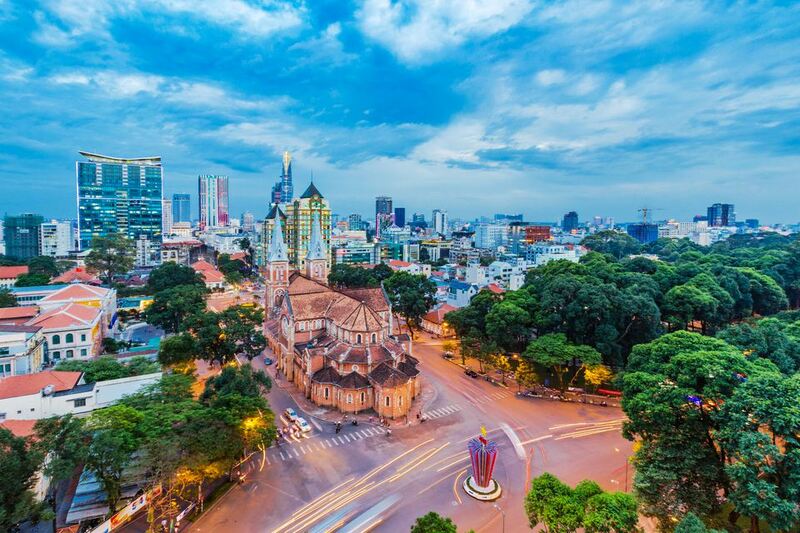 The next stop is Hanoi - you can take an evening flight or a morning flight the next day from Saigon's Tan Son Nhat Airport to the historic capital of Vietnam. The Saigon-Hanoi route is serviced by both Vietnam Airlines and Jetstar. When arriving in Hanoi, your first order of business (naturally) is to check into a Hanoi hotel. As the capital of Vietnam, Hanoi has no shortage of luxury hotels, while the low end is amply secured by a number of hotels in the Old Quarter. In the morning, stop by the Temple of Literature, an ancient university campus and now a museum and temple. The Temple is almost a millennium old, just a dozen years younger than the city of Hanoi. The Temple is actually a series of compounds linked together by a number of picturesque gates and a long trio of paths, culminating in an ornate Buddhist temple. Visitors are welcome to the Temple from Tuesday to Sunday, from 8 am to 5 pm. Take a short taxi ride west of the Temple of Literature to Hoa Lo Prison - the "Hanoi Hilton" much feared by American pilots. Fighter and bomber jockeys who survived being shot down over Hanoi were sent to this interrogation center, where they were tortured and brainwashed into submission. Today there's no trace of this ill-treatment of Americans; a single room in the whole museum shows a whitewashed version of American POW life in the "Hanoi Hilton", with the rest of the compound being devoted to the struggles of Vietnamese prisoners in Hoa Lo during French colonial times. Decompress after Hoa Lo by walking through Hoan Kiem Lake a few minutes' walk northwest. The Lake is a key component of Hanoi history - the origin myth of the Vietnamese nation took place here, where (shades of King Arthur!) future emperor Le Loi received a sword from a magic turtle. The sword enabled Le Loi to drive the invading Chinese out of Vietnam. Image © Mike Aquino, licensed to About.com. The picturesque Ha Long Bay is about 100 miles northwest of Hanoi, more than three hours' drive from Hanoi. Get there on a good day, and the long drive is definitely worth it. The bay features over a thousand limestone karst outcrops and islands, forming an undulating skyline that is absolutely breathtaking to see against a clear blue sky. The shores around the bay are home to freshwater swamp forests, mangroves, and beaches. The biggest island in Ha Long Bay, Cat Ba Island, has a hotel-resort on its beaches. The ride of choice on Ha Long Bay is a touring boat designed to look like a Chinese junk. Some have living quarters on board, providing an unforgettable honeymoon experience. The junks also do day trips, the highlight being a stopover at Thien Cung Cave, also known as "Heaven Palace" by Vietnam's tourism hacks. Visit this gallery of Images of Ha Long Bay to see the beauty of the bay for yourself. Go here to learn about Booking a Package Tour in Ha Long Bay and to find ​Reputable Tour Agencies in Hanoi. If you want to cut out the middleman, read this Do It Yourself Tour to Ha Long Bay. Visit this gallery of Images of Ha Long Bay to see the beauty of the bay for yourself. Go here to learn about Booking a Package Tour in Ha Long Bay, finding Reputable Tour Agencies in Hanoi, and comparing rates on Cruises in Ha Long Bay. If you want to cut out the middleman, read this Do It Yourself Tour to Ha Long Bay. On your last day in Hanoi, get up early to pay your respects at the Ho Chi Minh Mausoleum at Ba Dinh Square. In the mausoleum, Uncle Ho lies in state, receiving visitors all year round (with the exception of a few months in the autumn where the corpse is sent back to Russia for "reconditioning"). A number of monuments to Ho Chi Minh's life are within walking distance of the Mausoleum. First, visit the Presidential Palace, which served as an official residence to Uncle Ho, and which still serves as a venue for official functions like receiving diplomats. Uncle Ho never actually lived inside the Palace; instead, he had a stilt house built in the rear gardens. Ho Chi Minh's stilt house still stands behind the Palace, and is open to visitors; Uncle Ho's personal effects were left untouched inside the house's rooms. After you exit the Palace compound, you can pass by the One Pillar Pagoda on the way to the Ho Chi Minh Museum. The Pagoda is a reconstruction of a centuries-old temple demolished by the French as they retreated from Hanoi in the 1950s. Your last stop at Ba Dinh Square is the Ho Chi Minh Museum, a series of exhibits retelling Ho Chi Minh's life and struggle using modern art and his personal effects. You'll have enough time left to lunch and go shopping at the Old Quarter, a warren of old streets selling silks, toys, and other souvenirs. Don't stay out too late, though - you'll need to report to the Hanoi Train Station to take the train from Hanoi to Hue via Livitrans. The sleeper train from Hanoi to Hue via Livitrans is a relatively posh ride that leaves Hanoi at 7 pm and arrives in Hue, Central Vietnam by 9 am. If you've made prior arrangements with your Hue hotel, a ride will be ready and waiting for you at the station to take you to your accommodations. Engage a cyclo or an official tour agency to take you to Hue's numerous historical sites. The city used to be the Imperial capital for the Nguyen dynasty, the last ruling dynasty of Vietnam. The Nguyen emperors made their home at the Hue Citadel, which was bombed to near-oblivion during two devastating wars. The remaining buildings are still worth visiting and provide an interesting perspective into a dynasty in decline. Emperors were buried with much fanfare in a number of royal tombs scattered around the hills outside Hue. You'll need to secure a ride for the tombs, as they are distributed across long distances; three tombs worth seeing are the Minh Mang Royal Tomb, the Khai Dinh Royal Tomb, and the Tu Duc Royal Tomb. If the sun is still some way from setting after your last tomb jaunt, visit the Thien Mu Pagoda - "the Pagoda of the Heavenly Lady" - as your last stop. Transport tip: Apart from booking at a tour company, you can hire metered taxis, cyclos, or xe om to get you around these destinations in Hue. Prior arrangements can be made with your Hue hotel to hire an open tour bus that can pick you up at your hotel and take you on the four-hour drive to Hoi An. You're likely to arrive at Hoi An early in the afternoon, which will leave you with only enough time to lunch at Hoi An Old Town and visit its landmarks, including the Japanese Bridge and Tan Ky House, among others. The Old Town in Hoi An is a UNESCO heritage site located along the Thu Bon River. Once a bustling center of commerce, business faded after the river silted up, barring trading boats from docking along the riverside. The town's resulting obscurity saved it from the worst excesses of the last century's wars, and today, the newly-revitalized Old Town's streets, clan houses, stores, restaurants, and tailors do brisk business with tourists. Entry into select museums, houses, and attractions require a ticket. One ticket worth $4.50 gives you access to five out of the old town's 18 sites - one museum, one assembly hall, one old house, one traditional performance, and either the Quong Cong Temple or Japanese Bridge. Spend the second day of your Hoi An visit going further afield, to the My Son Sanctuary about 42 miles southwest of Hoi An. The My Son Sanctuary was the holy city of the Champa civilization that ruled Central Vietnam from the 4th to the 15th century AD. Over 70 structures make up the My Son Sanctuary; the buildings were constructed of red brick and stone, and were meant to glorify the nobility of the Champa king. The Champa were ethnically related to Malays, but were Hindu in religious bent; many of the structures were meant to pay tribute to the Hindu god Shiva, such as linga and yoni. Sadly, most of the buildings were wiped out during the interminable wars of the 20th century; American bombs eradicated much of the buildings in the My Son Sanctuary, and the complex is but a shadow of its former glory. On your way back to Hoi An, stop by the Kim Bong Village to watch old carving masters at work. The town has served as a craft village for hundreds of years - Kim Bong artisans helped in the reconstruction of Hoi An and temples all across Vietnam. Buy a carving or three to take home - the shops in Kim Bong helpfully ship all over the world. Image © Jake Robillo, used with permission. Your hotel in Hoi An can help you secure a ride from your hotel lobby to Da Nang (about an hour’s drive away), where the Da Nang International Airport offers flights back to Saigon. Depending on your bookings, you might have time to visit the Cao Dai Temple at Tay Ninh, near the Cambodian border. The fantastic temple décor is an amazing sight to behold, with writhing Technicolor dragons and an impressive Holy Eye staring down all who visit. The Cao Dai is a syncretic religious sect; its adherents hold Jesus, Buddha, and the Hindu god Brahma in high regard. If you leave for the Cao Dai temple in the morning, you may arrive in time to witness the noontime worship ceremony. Barring that, you might find time to explore Pham Ngu Lao one more time before boarding your flight home. How to Visit the Royal Hue Tombs - You need Wheels!